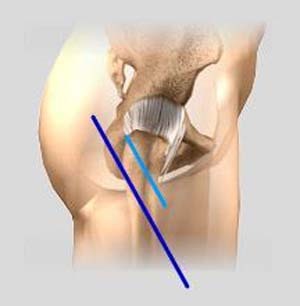 Traditionally, total hip replacement will be performed through a 10-12-inch-long incision made on the side of the hip. A minimally invasive approach has been developed in recent years where surgery is performed through one or two smaller incisions rather than the single long incision in the traditional approach. Advantages of the newer approach are less muscle dissection, minimal pain, quicker recovery, and faster rehabilitation. Arthritis is inflammation of the joints resulting in pain, swelling, stiffness and limited movement. Hip arthritis is a common cause of chronic hip pain and disability. The most common type of arthritis affecting the hip is osteoarthritis which is characterized by progressive wearing away of the joint cartilage. As the protective cartilage wears down, the bone ends rub against each other and cause pain in the hip. It is more common in individuals over 50 years old and tends to run in families. Your surgeon makes a 3-6-inch incision over the side of the hip to expose the hip joint. The muscles are minimally dissected to reach the joint. The femur is dislocated from the acetabulum. The surface of the socket is cleaned and the arthritic bone is removed using a reamer. The acetabular implant is inserted into the socket using screws or special cement. A liner material of plastic, ceramic or metal is placed inside the acetabular component. The femur or thigh bone is then prepared by removing the arthritic bone using special instruments and shaped to exactly fit the new metal femoral component. The femoral stem is then inserted into the femur either by a press fit or using bone cement. Then the femoral head component made of metal or ceramic is placed on the femoral stem. All the new parts are secured in place using special cement. The muscles and tendons around the new joint are repaired and the incision is closed. Avoid the combined movement of bending your hip and turning your foot inwards. Never cross your legs and bend your hips past a right angle (90o).